SOUTH HAMILTON - While daydreaming in his high school chemistry class, hockey goaltender Trevor Leahy began to think about the opposing forwards who buzz around him when Pingree School hits the ice. What are they looking for, he asked himself. But why does he wear dark blue pads that let shooters zero in on a target? Using computer skills he learned in a graphic design class at the private school in South Hamilton, Leahy sketched out new leg pads that blend into the goal netting behind him. He wanted pads, a trapper, and a blocker that are white with a raised double-stitched design, just like the goal. He applied for a design patent and had them custom-made by a Canada-based pad maker. "When the shooter comes down and only has a split second to shoot the puck, they're looking for net," said Leahy, a senior from Hampton, N.H., who grew up in Byfield. "If you put the net on the pad, they'll shoot at the pad instead of the goal." Since the days when Boston Bruins' goaltender Gerry Cheevers started inking stitches onto his mask each time the equipment protected his face, many goalies have expressed their individuality with designs and paintings on their mask or other pieces of equipment. But Leahy's design - essentially a camouflage for a goal that is 4 feet high and 6 feet wide - has hockey players and coaches amazed and impressed. Darren Stomp, the custom pad maker from Kingsville, Ontario, who designed Leahy's equipment, has had other goaltenders ask him to add orange and black tiger stripes and other designs. But those changes were cosmetic. "It might be the most clever idea," Stomp said. "I don't think there's any question it will work, although to what degree depends on the shooter and the situation." So far, Leahy has logged two shutouts with the pads. In practice, two of Pingree's top scorers say, the illusion is particularly effective when there's a scramble in front of the net and they need to shoot quickly. "When you're in close and you don't have a lot of time to think, it does catch your eye, and you do shoot toward it sometimes," said Matt MacDonald, a cocaptain from Byfield. Both MacDonald and senior Tony Sardo of Gloucester say they have fired the puck directly into Leahy's pads. The illusion diminishes if they are farther from the net, with more time to shoot. "I've never seen anything like them," Sardo said of the pads. Not everyone is as sold on the theory. In the locker room after a recent 4-3 overtime loss, players from Dexter School of Brookline said that they barely noticed the design on the pads and that it didn't attract their attention - or their shots. "I noticed it, but just thought it was a design on the pads," said senior forward Robert Lerro. "It just looked like squares." 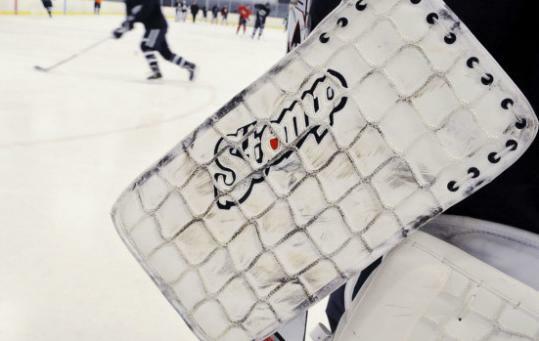 John Gardner, the longtime hockey coach at Avon Old Farms School in Connecticut and president of the New England Prep School Ice Hockey Association, said the association has received no complaints about the pads. The association follows National Collegiate Athletic Association rules, he said, and regulations regarding goalie pads are basically confined to the size of the equipment and not the design. "It's a novel idea," said Gardner. Leahy applied for the design patent last February, and it is pending. He and his mother, Judie, flew to Canada and met with Stomp on Oct. 13 to discuss ideas for implementing the design. He received the pads Nov. 29, and began using them in practice and then in games. At the Pingree Holiday Tournament in late December, Leahy backstopped Pingree to two shutouts in one day - a 1-0 win over Northwood School from Lake Placid in the morning and a 3-0 win over Kents Hill School of Maine that night. For the season he has a goals-against average under 2.00, and he has had some memorable nights with more than 40 saves against some of the prep school elite teams. Longtime Pingree coach Buddy Taft won't give all the credit to the pads - the 5-foot-6-inch Leahy is very quick and has worked on his game, he says - but thinks the theory Leahy used to develop the pads has merit. "It all makes sense," he said. "I'm not sure if there's any effective way to test their success, but he's played pretty well." Leahy wrote a paper about the process as part of his application to the University of New Hampshire (the paper referenced Darwinism and creatures that adapt to their habitat via camouflage), and received notice of early acceptance. He has also applied to Northeastern, Providence College, Emerson College, and Boston University. "We really encourage our kids to think outside of the box," Taft said. "Trevor is a good example of that." Exactly what will happen to the pads after this season is unclear. Leahy said he would like to play hockey in college, probably at the club level, and wants to market the idea. "It would definitely be cool to get it out there and get other guys in the future wearing it," he said.